One of this Gal’s goals for 2015 is to run all 3 Great American Brewery Runs Races or at least walk all three. Last year a couple of my gal pals and I participated in the Flying Fish 5k which happened to take place on one of the HOTTEST days of the year yet, we still had such a good time we decided try for the trilogy this year. Now allow me to clear up any misconceptions you may have that I’m a runner. I am not…at all! Ok, I have run a couple of 5K’s and mud runs in the past but it’s been a while since I ran so from the time I registered for this race I had plans to walk it. I enjoy challenging myself but I also want to have fun and I was in this for the fun and the beer. 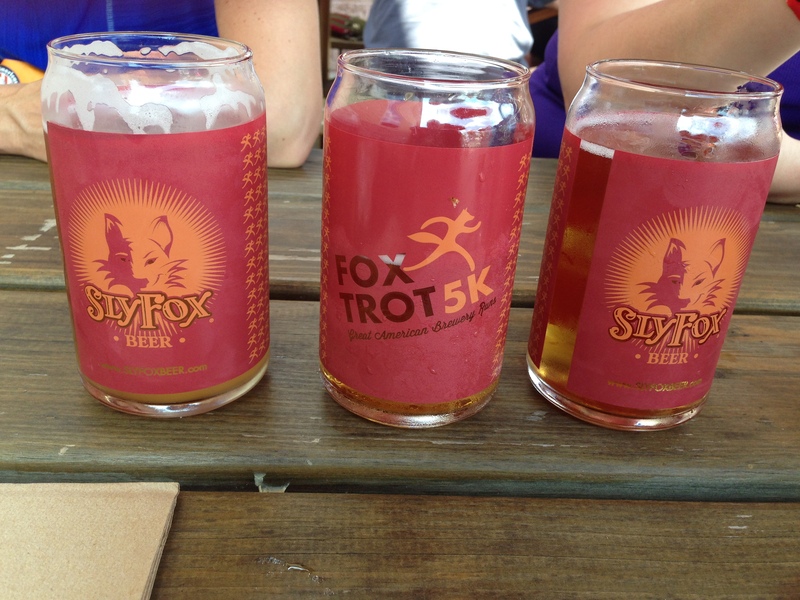 That’s right each racer gets a special race glass filled with beer at the end of the race! Oh and the races raise money for charity – a win for all! 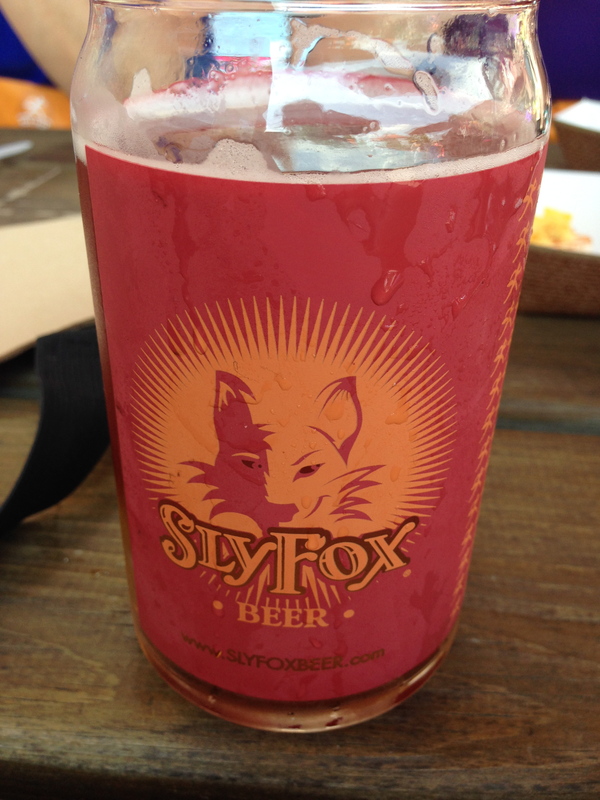 First up on the Great American Brewery Runs schedule for 2015 the Sly Fox Brewing Fox Trot at the Sly Fox Brewery. I had only ever been to the Sly Fox Brewhouse in Phoenixville, PA and not to the Brewery itself so I was excited to finally be able to check it out. After being to both I prefer the atmosphere and character of the brewery. Race Day! Believe me when I say after last year’s ungodly heat at the Flying Fish race I was watching the weather closely. It was scheduled to be hot but thank goodness cloudy. At least the sun wouldn’t be blaring down on us. The brewery was a solid hour and fifteen minutes away so an early morning start was required. We arrived at the brewery on schedule, 8:30am, to pick up our race packets and to get a feel for the lay of the land. The brewery is located in an industrial park not far from houses and surprisingly a fair amount trees and grassy areas. Right next to the brewery parking lot was a large grass field where the band and food trucks for the event set up. It made for a great place for people to kick back and relax after the race. That’s right this is a relaxed party atmospher – you just have the pesky race to run first. After picking up our packets and pinning on our bibs it was time to check out the brewery. Outside there are several picnic tables with umbrellas to sit and inside there are also a few picnic tables plus a long bar. On this day there were no bar stools but I’m not sure if that’s the norm or because of the large event. 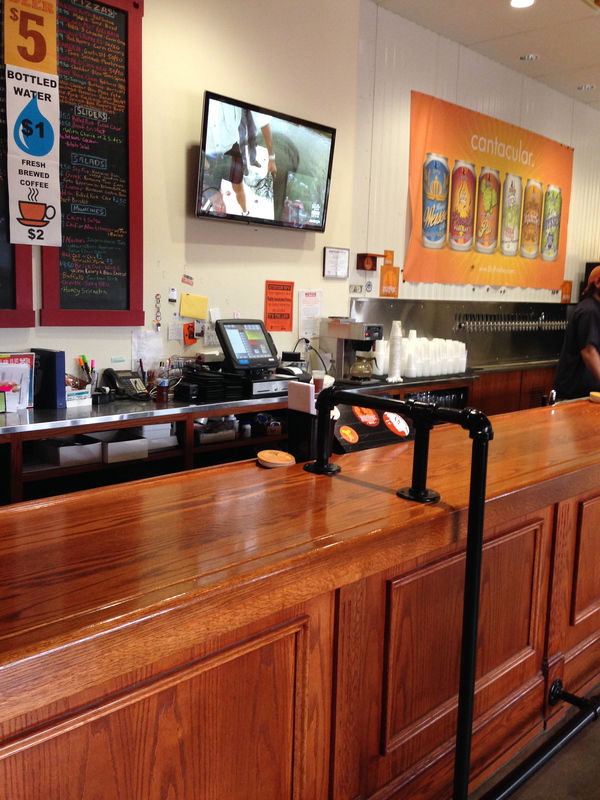 Besides their beer they also offer a small food menu with flatbreads, salads and nachos. I didn’t try any of their food but it looked tasty. After checking things out we choose a picnic table outside to sit and relax at until race time. Folks came around prior to the start of the race to place our 21+ wrist bands on so we wouldn’t have to wait after the race for an id check to get our beer. As we sat waiting for race time the food trucks started arriving and setting up. The three of us were hungry so with each food truck arrival we got excited and couldn’t wait to get something to eat after the race. Race Time! Finally it was time to make our was to the start line. It was hot but fortunately still cloudy out. Until just a couple of minutes before the race started then the clouds parted and the BLARING sun shown in all it’s blazing glory. NOOOOO! Immediately the temperature rose and every one started sweating just standing there. Oh this race just became so much longer. Suddenly we were off! The Course – now if you’re thinking because it’s a brewery run the event planners choose a flat easy course you are wrong. This course was full of hills, lots of hills and road kill. Seriously folks clean up the road kill prior to the race. It’s not like these poor critters had just passed it was obvious they had been there a long while – eww. Slowly I made my way up every hill and was ecsatic when I reached the water station which meant I was have way through the race and closer to beer! Whoo hoo cause by this point it was stinking hot. Finish Line! There it was the finish line and water. I crossed the line and asked for two bottles please. Hey, I was toward the back so must folks already received their water and they had plenty left for those behind me and well, I needed two. The guy informed me I could always refill my bottle at the water refilling station. Yup, I was aware of the filling station prior to the start of the race but I was also aware this station was set up right next to the port a potties and the location was gross and the set up not really sanitary. So I wanted two bottles and enjoyed them both immensely. The Party – I met up with my friends, they’re runners so they finished way before me, enjoyed my first bottle of water and headed over to the beer line. The line was long but moved supper quick. Not only did each racer get a beer but we also received a cool koozie. 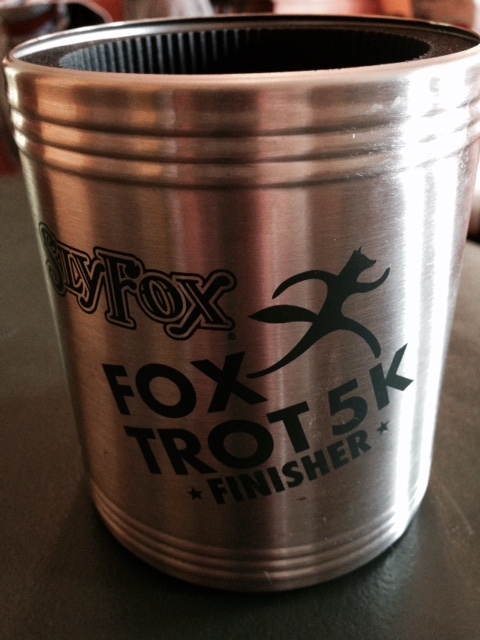 If you registered as a team of 10 or me you also received a growler. Each racer received a glass of Grisette Working Class Ale 5.6% (2014 GABF Gold Medal Winner). Super psyched that it was a farmhouse ale they were serving. Perfect style for an end of race beer. This one had the farmhouse standards that I love, earthy bread, coriander and citrus. Next we needed food, only we no longer found the different food truck options as appealing as we did prior to the race. We were hot now and heavy, rich food just wasn’t going to cut it. Plenty of folks enjoyed the pork parfait, fried cheese curds and such but the three of us opted for a quinoa chickpea patty. It was good, not heavy and filled us. Luckily there were plenty of spots in the shaded picnic table area for us to relax at and enjoy our sandwich. It was also time for another beer. I chose the Abbey Extra Belgian Pale Ale 5.7% – clean, crisp malty beer with hints of spice and fruit. Normally I would prefer a little more body to an Abbey but this was perfect for the hot day. After finishing up our beers it was time to head back home. Unfortunately, the brewery wasn’t allowing any take out purchases on this day understandable but disappointing. However, overall a fun day! Next up the 2015 Flying Fish 5K and I hope they announce a date soon for the Yard’s Dash! Side note: So far I’ve found these Great American Brewery Runs to be well organized with plenty of water, bananas and pretzels at the end of the race course and a sufficient amount of port of potties for the racers to use.